Gun safety in the home can be as easy as using a gun lock, seen here. Gun locks are available for free thanks to industry partners and the National Shooting Sports Foundation. If you own a gun, you need to develop a gun security strategy. Period, paragraph, end of story. If you have kids in the house, that strategy needs to be an every day endeavor. If you don’t, but kids or guests cross the threshold of your home more than once per millennium, you still need to think about gun security. Yes, the best security is training and education. But don’t forget to include visitors, who may not be as well-trained as your family, in your gun safety plan. With a veritable plethora of safe gun storage options readily available, there’s just no excuse for an accident resulting from unauthorized gun access by a child or house guest. As with most consumer products, you can spend a lot of a little depending on the features and quality you want. The best news? For gun owners, the solutions start at the very reasonable cost of… free! Of course, if you want extra features and gizmos, you can pay more. Let’s take a look at a couple of solutions across the spectrum of free to platinum level. If you want to get real gun safety results in your home, you need look no further than the gun industry itself. The National Shooting Sports Foundation’s Project Childsafe program has been delivering free, yes free gun locks to anyone who needs one for years. By partnering with local police stations across the country for delivery, the industry has delivered, to date, over 36 million safety kits including a free gun lock and safety brochure in all 50 states and 5 U.S. Territories. If you’re keeping count, that’s exactly 36 million more safety kits than Michael Bloomberg has delivered to date. If you’re a gun owner, or a gun user in the law enforcement or security professions, you can render your gun safe at home for no cost at all. NSSF Safety Kits include a cable lock that renders a handgun completely inoperable. If you have a semi-automatic handgun, the cable winds through the slide and magazine well, preventing the gun from being loaded or fired. Revolver? No problem. Run the cable lock through the cylinder to put the gun out of operation. You can use a simple cable lock on most any kind of handgun, rifle, pump or semi-automatic shotgun. To find out where you can get a free gun lock, just visit projectchildsafe.org. 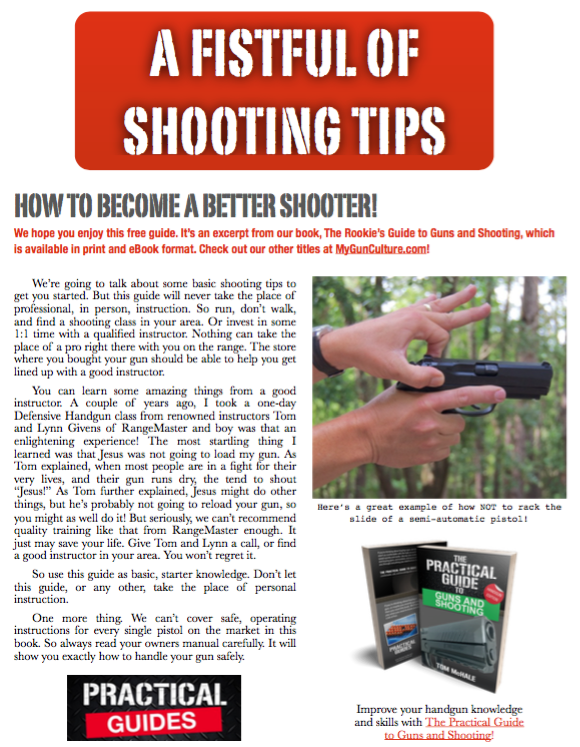 Grab a copy of my free eBook, A Fistful of Shooting Tips. It will help make you a better shooter and the envy of your range in no time. A few weeks back Gander Mountain was giving away free trigger locks. Cool! This is the kind of thing we need to tell people about. The industry does a good job with actual safety programs.